Mr Thomas Gradgrind’s speech, the opening paragraph to Hard Times, is probably as famous as the novel itself. Published in 1854, Hard Times tells the story of a fictional Northern industrial town by the name of Coketown, and particularly of the Gradgrind family. Thomas Gradgrind brings up his children according to the strict precepts of Fact. But when Cecelia Jupe, the daughter of a circus performer, enters their lives, the Gradgrind children come into contact with a different, warmer, far more human world than the one they had thus far inhabited. Hard Times was my first foray into Dickens’ novels proper – before I’d only read the odd short story and A Christmas Carol. The reason why I decided to read Hard Times for the Classics Circuit Duelling Authors tour is not because I’m #teamdickens rather than #teamausten, but because next month I’m going to see a stage adaptation of this novel by the same theatre company who did the production of A Christmas Carol I raved about last December. Hard Times will be performed at an old mill and will no doubt draw on Manchester’s industrial history. As I’m sure you can imagine, to say that I’m excited is an understatement. But moving on to the novel itself: I quite enjoyed Hard Times for what it was, though while reading it I was well aware of what someone who is not a Dickens fan (or just not a fan of this novel) could take issue with. For example, the social commentary in the novel is obvious to the point of heavy-handedness, but then again what is now obvious did once did need to be said. Dickens’ points about the dehumanisation of the working classes and the precarious conditions they live under may seem very evident, but they’re made with real passion and heart. And if you expand the geographical circle you’re considering, they’re as valid now as they were a century and a half ago. Having said that, I did find Dickens occasionally guilty of oversimplification – his portrayals of Trade unions or Utilitarians, for example, are not exactly rich in nuance. I think some of the things that make him such a vivid, engaging writer also work against him, and one of them is his tendency to illustrate his points through ethical black and whites. The same is true of the characterisation in Hard Times: the characters are certainly memorable, but they resemble types or caricatures more than real human beings. Furthermore, his women are all very stereotypically Victorian – angelic and sacrificing. He’s certainly no Wilkie Collins in that regard. Still, I have to say that the characterisation issues bothered me a lot less in Dickens than it probably would in any other author, which is a testament to how well he does what he sets out to do. What I enjoyed the most about Hard Times was the fact that it’s ultimately a tribute to the imagination and the role it plays in making us human. I don’t buy into the diametrical opposition between the imagination on the one hand, and reason, fact or scientific-mindedness on the other that the novel presents, but the theme really spoke to me all the same. Again, Dickens managed to annoy me considerably less than any other author who did the exact same probably would. This doesn’t sound like much of a compliment, I know, but actually it is. There was a library in Coketown, to which general access was easy. Mr. Gradgrind greatly tormented his mind about what the people read in this library: a point whereon little rivers of tabular statements periodically flowed into the howling ocean of tabular statements, which no diver ever got to any depth in and came up sane. It was a disheartening circumstance, but a melancholy fact, that even these readers persisted in wondering. They wondered about human nature, human passions, human hopes and fears, the struggles, triumphs and defeats, the cares and joys and sorrows, the lives and deaths of common men and women! They sometimes, after fifteen hours' work, sat down to read mere fables about men and women, more or less like themselves, and about children, more or less like their own. They took De Foe to their bosoms, instead of Euclid, and seemed to be on the whole more comforted by Goldsmith than by Cocker. Mr. Gradgrind was for ever working, in print and out of print, at this eccentric sum, and he never could make out how it yielded this unaccountable product. In that charmed apartment, the most complicated social questions were cast up, got into exact totals, and finally settled - if those concerned could only have been brought to know it. As if an astronomical observatory should be made without any windows, and the astronomer within should arrange the starry universe solely by pen, ink, and paper, so Mr Gradgrind, in his Observatory (and there are many like it), had no need to cast an eye upon the teeming myriads of human beings around him, but could settle all their destinies on a slate, and wipe out all their tears with one dirty little bit of sponge. ‘Because they are improvident,’ said Mrs. Sparsit. ‘To be sure,’ assented Mrs. Sparsit, eating muffin. Hard Times may not have become my new favourite Victorian novel, but I think my experience with it bodes well for my future forays into Dickens. Now I only need to decide between Great Expectations and Bleak House. I think the only Dickens' I've read is A Christmas Carol. I really enjoyed it, but not I'm not sure I really want to tackle anything else. This is my least favorite Dickens novel, so maybe this is a good one to start out with -- I found it disappointing after reading several of his other works which I liked so much better. Compared to his other novels, the plot and characterization are really lacking. I agree that his young female characters are usually dull and angelic -- in other longer novels there are usually other women who are much more interesting, and they're both bad and good. I think this novel is the shortest because he left all the good stuff out! If you want to explore more Dickens I highly recommend Great Expectations and Oliver Twist. Bleak House is by far my favorite but it might be a lot if you're not used to Dickens -- there's a ton of characters and plot lines. They all come together in the end, and it's really worth reading. And how fun that you'll be able to see a stage version! That sounds exciting. I did not recognize the famous quote from the beginning. I really don't think I can handle reading any Dickens but I do enjoy reading your thoughts. I loved Bleak House! But my favorite, favorite Dickens--so far, at least--is Our Mutual Friend! I just loved, loved, loved that one! >I absolutely loved his language, his humour, and his powerful satire. 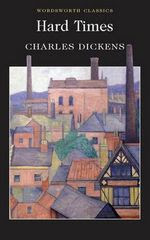 I didn't like Hard Times, but I have to admit that Dickens has a way with words...I did enjoy the quotes you provided. Well-chosen. I haven't read this one yet -- but a lot of people have written about it for the Circuit this week! I'm fascinated by Manchester era issues, so maybe I'll enjoy it. And so awesome about the upcoming play. So wonderful sounding!! I'd say go with Great Expectations next. I'm in the midst of rereading it myself, for the fourth or fifth time, who knows. It's one of his best and much easier to approach than Bleak House, which is also excellent, by the way. While I do like Hard Times, I do think it's one of his lesser works. There are some very good bits in it though. I have to say, that as a teacher in America today, this book hits much too close to the mark. Facts and nothing but facts is darn close to what we're being forced to do to our students thesedays. I would recommend Great Expectations for your next Dickens. I loved it! Miss Havisham is one of the most memorable characters ever. I just downloaded Bleak House. I think that one is going to be my next Dickens so if you decide to pick that one up, I'm interested to hear how it goes for you. Having read both Great Expectations and Bleak House over the past two years, I would definitely recommend reading Great Expectations first. It's shorter, more accessible, and my favorite Dickens novel(so far)! I am overly intimidated by Dickens, because I loathed the only book of his I've read I(A Tale of Two Cities). I may give this one a try though. I love Dickens in a big way, and one of my goals is to read all of his work during the next couple of years. I have read Great Expectations and am in the middle of A Tale of Two Cities and find that he has a knack for creating the strangest characters and situations that I end up relishing. I have not seen a lot of press on this one, but you also mention you want to read Bleak House which is another one that is way up there on my list of Dickens' books to peruse. 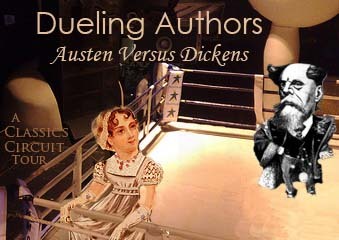 I think he's an amazing author, and though I do love Austen, Dickens beats him out by a mile in my mind. Great review, and I am glad that you liked it. I hope to hear more about the production that you attend in the future as well! Another Dickens lover here -- I don't think you have to choose between him and Austen. Definitely, nuances of character are not his forte, nor strong women. But he's one of the greatest storytellers of all time. Hard Times isn't a good example of his work though, but because it's relatively short, like A Tale of Two Cities, it's often where people start or the book of his that they get assigned in school. Great Expectations is the best place to start. It's also good for younger people because it's so much about the experience of youth and feeling that you'll never find a place in the world. He's very good at that. For the confirmed Dickens buff, the ones who love the way he pulls you into the world of Victorian London and creates those amazing plots, it seems like Bleak House and Our Mutual Friend are often the favorites. I love both. He's so funny, so great with setting a scene, and the bits of social satire are so on the nose. The famous lawsuit in Bleak House is a great example. While most of his characters are not especially complex psychologically, he does deliver a wonderfully rich picture of a social environment. I envy every reader who hasn't already read these books -- they have so much fun in store. As for me, I'm down to the dregs in my search for the Dickens I haven't read yet -- Barnaby Rudge, anyone? I didn't think so. It has, as Sherlock Holmes would say, its "points," but not enough of them. I tried to read a few Dickens books when I was a teenager, never enjoyed any of them, apart from A Tale of Two Cities, but then again, maybe I was too young to appreciate them. This is interesting, and such a great review. I've read a lot of other Dickens' novels, but not this one. I love your analysis of his message and caricatures, since it might be too easy to simply brush them off as a product of the time and not within our realm to consider. You remind us here that understanding writing and rhetoric help us to not just be bystanders in a conversation, but to join it and consider it for ourselves. I really need to get around to this novel and am so glad you've given me a way into it. Thanks! I'd second those who suggest 'Our Mutual Friend' (with two quite strong-minded heroines) - and my favourite of all, 'Little Dorrit'. I think 'Hard Times' isn't his best: I don't know if Dickens is ever quite happy out of London - a city which is as much of a character in his novels as any of the people are. I'm not personally fond of 'Bleak House'. But 'Great Expectations' had my 19 year old daughter laughing out loud - she called me to say she had never quite realised how funny Dickens really is. Which is quite a tribute, I think! Thank you so much for the recommendations, everyone! I think I'll start with Great Expectations and see where else to go from there. Your enthusiasm has me more excited to read Dickens that I ever thought I'd be, and I can't tell you how much I appreciate that. I haven't read this one, although I'm a big Dickens fan. Actually I haven't delved into Dickens for a while now. Hope you enjoy the play and explore more of his novels! I haven't read this one yet, but I've read quite a bit of Dickens. I'd second everyone's recommendation of Great Expectations. It's wonderful! What a great, thorough review! I haven't read much Dickens (I had a bad experience reading Great Expectations over spring break in college), so I might try this oen out. Thanks so much for sharing!